++++SOLD++++OVER $100,000 INVESTED MORE INFO THIS VEHICLE IS LOCATED @ 8960 PERRY HIGHWAY LW 2 412 366-7400 We are offering a 1 of a kind 1968 AM GENERAL M35 A2 Off Road Vehicle for sale; this vehicle has over $100K invested into the restoration! This truck is in good condition. 10 Wheel Drive, Yellow Painted Tow Hooks on Front Bumper, Heavy Gauge Chain on Front Bumper for Tow Hooks, Led Turn Signals on the Front Bumper the Vehicle, Led Rear Taillights, Reflectors all around the vehicle, Windsheild Wipers, Anti Skid Adhesive, CD Player, CB Radio, 3 Inert 50 Caliber Machine Guns, Mount for a 4th Machine Gun, Wooden Bench Seating in the Bed on Both Sides, Shovel Axe Pick Set under Drivers side of the Cab, Full Size Spare with a New Tire, U.S. Government Gas Can, Ammunition Cases in the Bed, MudFlaps, Multiple Mirrors on the Side Mirrors, Toolbox in the Bed ot the Vehicle, Working Antenna, and more! The All Terrain Vehicle has a Turbocharged 7.8L 6 Cylinder, 134hp, 330LB Torque. The vehicle is clean and has very low miles for a 1968! This AM General M35 A-2 is ready to go! Please view all pictures closely and ask all questions before buying. ABOVE AVERAGE FOR A 1968 VEHICLE! WE HAVE SOME NOTES ON THIS VEHICLE FROM THE PREVIOUS OWNER ALONG WITH MANUALS ON THE TRUCK! CAN RUN ON GAS OR DIESEL! 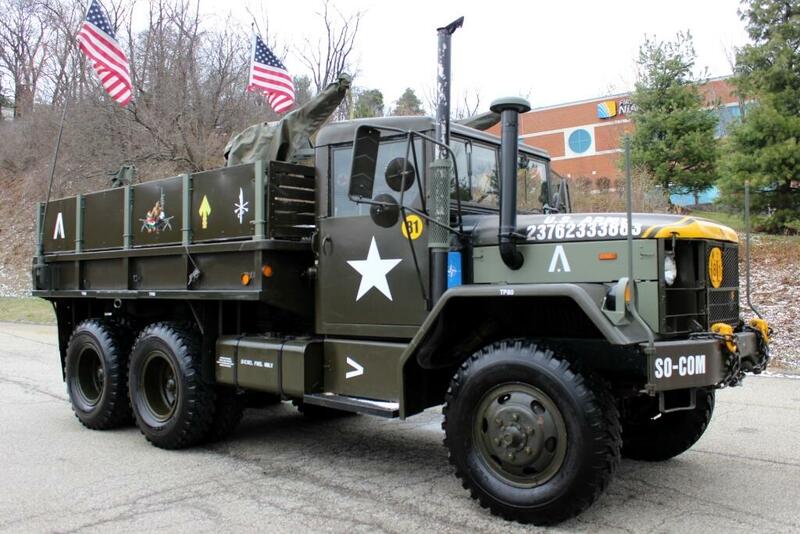 AM General has always been known to manufacture very reliable vehicles and this vehicle is a perfect example. This AM General A2 has ONLY 15,557 original documented miles. THIS AM General A2 RUNS GREAT! The vehicle is in good condition mechanically and good condition aesthetically. The vehicle is powered by Turbocharged 7.8L 6cyl engine, which runs very strong and smooth. The manual transmission shifts perfectly into every gear and is noise free. The suspension on the vehicle is tight and drives smooth on the road. All vehicle functions work good. The wheels are 20" on all 10 wheels. The wheels are in very good condition and show some normal wear (see pictures). The tires are like new all the way around (SIZE 10/00-20)The tires are CEAT Traction Grip. The overall condition of this vehicle is very good. The exterior is in good condition. Would rate the exterior 8 out of 10. Call us and we will go over the vehicle while you are on the phone (724)799-9563. This AM General M35 A2 has a nice color scheme, the exterior is green and the interior is green. The interior is in very good condition. The drivers bench seat has some tears in the cloth. The other bench seat is in good condition. Would rate the interior 8 out of 10!. Don't pass this one up!!! Message: Thought you might be interested in this 1968 AM General M35 A-2 .